To achieve the warmth, I used freshly cooked oatmeal right from the stove top and warmed up the milk. I also added the blueberries to the oatmeal while cooking. The thick consistency of this smoothie helped it retain the warmth for about 20 minutes. It was too thick to guzzle down. I highly recommend that you soak your oatmeal before cooking. Please see my Fruity Oatmeal Smoothie for soaking instructions. It’s not much work and definitely worth it. This is a well-rounded, meal replacement smoothie that’s ideal for breakfast. I used raw milk in my version of this smoothie. That along with the peanut butter and blueberries provided enough sweetness for my palate. You can sweeten with one of the recommended sweeteners if you prefer. Enjoy! 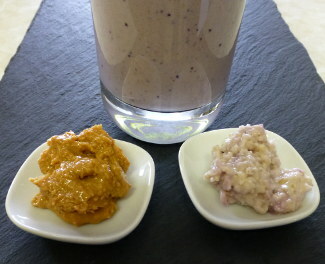 I’d love to know if you try this warm peanut butter oatmeal smoothie and how you liked it. Please leave a comment below. Happy Blending! You’re welcome, Mark. E-book on its way. I’m thinking this could be done cold using refrigerator oatmeal instead…as I’ve already had my breakfast smoothie, this one just might make the lunch list today ☺ I love peanut butter and bananas in oatmeal! Yes, you can make this smoothie with cold or refrigerator oatmeal – “warm” is not required. Enjoy! I thank God for you. I have been to countless doctors and they keep giving me antibiotics for acid reflux and GERD. You describe my situation to the “T” and gave us very solid information for the cure. I am one happy camper and on my to healing and good health. Always nice to hear when my information is helpful, Frita :) To your good health! I am going to make this breakfast and weight loss smoothie at the end of this month.I will let you know what It takes like etc.I love oatmeal and cream of wheat hot cereal but I have never tried it in a blender with the ingredients that is in your peanut butter oatmeal smoothie. Let me know how it turns out, Kim. This site is definitely going in my browser’s bookmarks area.